This extraordinary vintage pen is a 1930 Aurora Duplex Large lever-fill in Jade with Black ends. The “Duplex” was Aurora’s first celluloid pen. 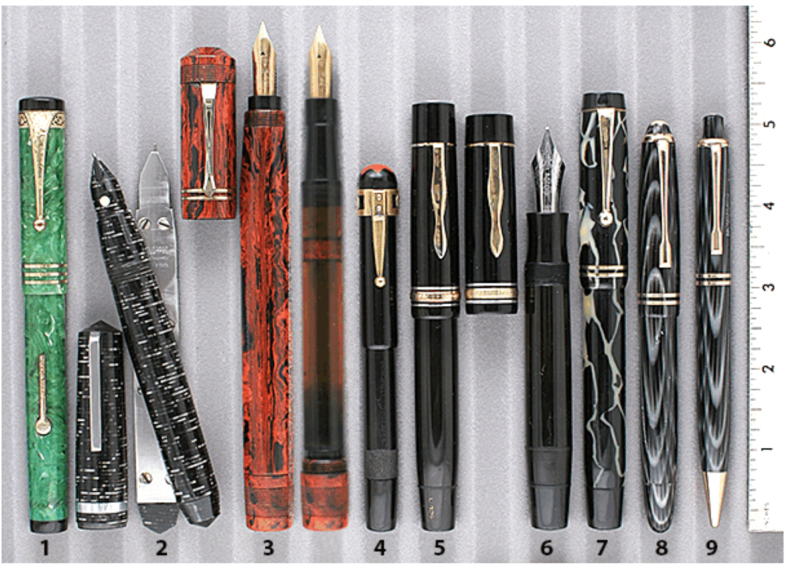 A “Duofold” look-a-like, made in the very early years of Aurora, when their design was highly influenced by US pens. In 1927 Aurora introduced the “Duplex” in Red Hard Rubber with black ends. In 1929 the celluloid Duplex was introduced in five versions and five colors. This is one of the rarer models, with its repousse clip having a floral filigree design and three cap bands. Medium, flexible nib. Slightest tinge of ambering, otherwise near mint+. Item #1 in Catalog #85.